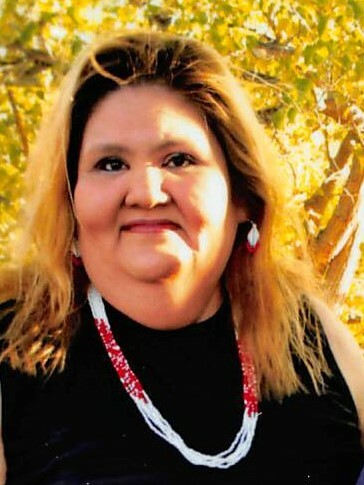 Rhonda Marie (Loma) Reynolds age 45, of Broken Bow, Oklahoma gained her angels wing on Saturday, April 6, 2019 at her home surrounded by loved ones. She enjoyed spending time with her nieces, nephews, babysitting her cousins and others, playing pool, going to Pow Wow’s and talk and visit with family and friends. She was of the Baptist faith love to sing, go to church and help out and cook and host gatherings. Rhonda was preceded in death by her husband, James Reynolds; two unborn children; mother, Glenda Jean Wade Loma; paternal grandparents, LeRoy Loma and Sarah Lewis; maternal grandparents, Carlo and Esien Wade; aunt’s, Mary Jane Wade Battiest, Marilyn Thomas, Betty Sullivan and Jena Loma; uncles, Kenneth Loma, Cecil Wade, Winston Davis Jr., Jimmy Paxton, Raymond Battiest, J.L. Sullivan, and Ruben Duckett. Rhonda leaves to cherish her memory her father, Edward Loma, mother, Ceeny Morales, father-in-law, Tommy Morales ; children, Alexis Day Reynolds and James Elwood Reynolds; brother, Daniel Loma and wife Dawn, Eddie and Mel Morales; sister, Alicia Noah and husband Bobby; nephews, Taylor Long, Brennan Long, Derek Noah, Nathaniel Loma, Aiden Morales; nieces, Kasi Jo Noah, McKenzie Loma, Seneca Loma, Ashlyn Loma; and special cousins, Keosha Ludlow, Kisha Ludlow and Jerry Ludlow and a host of other relatives and friends. A wake for family and friends will be held on Tuesday, April 9, 2019 from 6:00 to 8:00 P.M. at Bunch-Singleton Funeral Home Chapel. A Celebration of Life will be held on Wednesday, April 10, 2019 at 2:00 P.M. at Bunch-Singleton Funeral Home Chapel in Broken Bow, Oklahoma with Bro. Daniel Loma officiating. Interment will follow at the County Line Cemetery in Pickens, Oklahoma.